bilaterals.org | KCTU union member attempting self-immolation as an act of resistance KORUS FTA! Around 3:55 pm, April 1st, Bro. 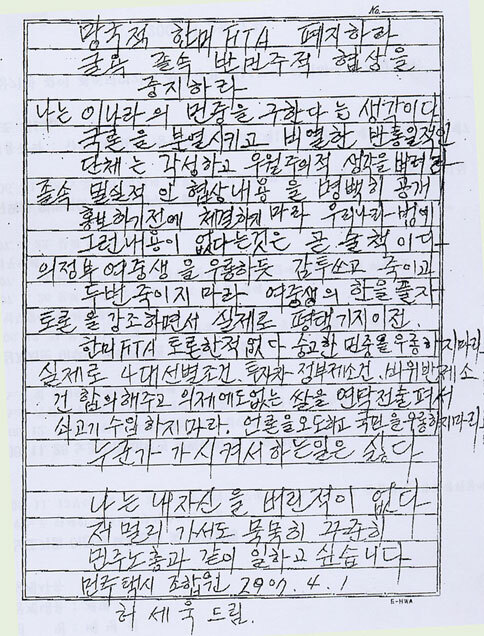 Heo Se-Wook (54), a union member of KCTU, was attempting to suicide by self-immolation as an act of resistance against the Korea-US FTA negotiation. His health condition is very serious and receiving an emergency medical treatment at the Hangang Scared Heart Hospital. The last round of high-level negotiation between Korea and US governments is being held at Hyatt hotel, Seoul and today is the last day. The deadline of the FTA negotiation will be midnight today. So KCTU and Korean people were demonstrating in front of the negotiation site, Hyatt Hotel. During the demonstration, he attempted self-immolation with the voices of “Stop the Korea-US FTA and President Roh, Step Down!”. KCTU strongly denounce the Korean government to push this anti-workers/people Agreement and urge to stop the KORUS FTA immediately which is killing workers and people. We need your solidarity and support. We will continue to update the development of this incident. Stop the Korea-US FTA(Free Trade Agreement) which will destroy my nation! Stop the KORUS FTA negotiation which is undemocratic and makes us humiliated! I believe that (my self-immolation) will save the Korean people. Cowardly and anti-reunification organizations which split the public need to be awakened and throw the sense of superiority away. Do not conclude the secret and undemocratic FTA negotiation until the contents of negotiation are open to the public. The argument of the government that there is no legal base to do so is a trick. Do not kill the people in twice like the case that two female middle school students were killed by an armored vehicle of US forces in South Korea in June, 2003. In spite that the government has continued to emphasize the importance of dialogue, there have been no dialogues with concerned parties regarding the important social issues such as the KORUS FTA and the expansion of US military base in Pyongtaek. Do not make a fool of ordinary people with dignity. The government has already committed to four preliminary measures* as preconditions for FTA talks to begin and agreed with the clause on investor-state claim during the negotiations toward the KORUS FTA. Despite these facts, the government is trifling with the ordinary people through the smoke-screen tactics that it will protect the rice. Do not import US beef with "mad-cow" disease. The government should not mislead the press and make a fool of ordinary people. I don’t like to do what someone orders me to do. I haven’t given up myself until now. I want to continue to work together with KCTU even after I will have gone to the heaven. * Note : Four preliminary measures included 1) suspension of regulations on pharmaceutical products, 2) easing of government regulations of gas emissions from imported US cars, 3) resumption of importation of US beef, and 4) reduction of thequota which requires South Korean cinemas to screen South Korean films from 146 to 73 days per year.